Abstract: The four PCI Express slots are configured in x16, x0, x4, x0 mode when one videocard is installed. When two graphics cards are installed, say for ATI Crossfire, the four PCI Express slots are split up in x8, x8, x4, x8 mode. For business downtime costs money, that's why it is wise to purchase enterprise class hardware. There can be quite a large price difference between true workstation gear and desktop components, the reason generally is that professional gear goes through a more stringent QA process to ensure parts and components have no compatibility or reliability issues. With enterprise class hardware there are often some very neat integrated features, extras that are normally never found on desktop products. Options like SCSI, 64-bit PCI or miniPCI expansion slots, or in the case of the Asus P5W64 WS Pro motherboard no less than four PCI Express x16 slots for videocards! The capability to support four PCI Express x16 videocards means this system can support up to eight monitors! That is a serious amount of desktop space! Based on the venerable Intel 975X Express chipset, the P5W64 WS Professional is ASUS' most current stab at a workstation motherboard. The multitude of PCI Express x16 slots is possible thanks to an IDT 89HA0324 PCI Express switch, which we'll get into in a moment. 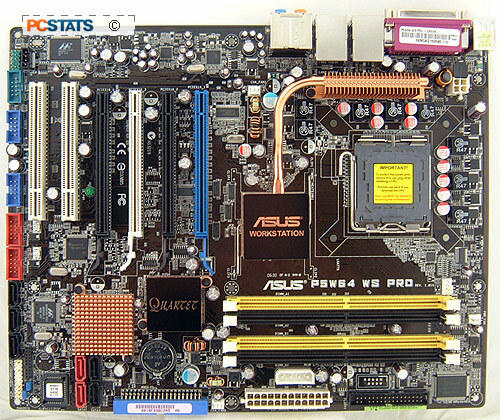 The Asus P5W64 WS Professional motherboard supports all Socket 775 processors on the market from the Celeron D to the Pentium 4/D/XE, Core 2 Duo and Core 2 Extreme processors no matter the FSB (533/800/1066 MHz inclusive). The ICH7R Southbridge natively supports four Serial ATA II hard drives along with RAID 0, 1, 5 and 0+1 support. If you require more hard drives, the P5W64 WS Professional bristles with a four port PCI Express Marvell 88SE6145 Serial ATA II controller. It adds three more SATA ports internally, and one eSATA port. The Marvel SATA controller handles RAID 0, 1 and 0+1 settings; great if you choose to play it safe with redundant drives. Asus' P5W64 WS Professional includes the full list of must-have's: it's got a high definition 7.1 channel Azalia audio controller, dual Gigabit network cards, two IEEE 1394a ports and eight USB 2.0 slots (four on the rear I/O, four via headers), a COM port header for RS232 devices, and one single IDE channel for optical devices. The board has two 32 bit PCI slots for expansion, and its four DDR2 DIMM slots will handle up to 8GB of PC2-6400 memory. If you are running Windows Vista, PCSTATS recommends installing at least 2GB right from the start. The four PCI Express slots are configured in x16, x0, x4, x0 mode when one videocard is installed. When two graphics cards are installed, say for ATI Crossfire, the four PCI Express slots are split up in x8, x8, x4, x8 mode. Thus each Crossfire videocard would receive 8 lanes of PCI Express. It's easy to see that the Asus P5W64 WS Professional is a motherboard with a lot of potential packed into it. Retailing for $340 CDN ($290 US, £148 GBP) the P5W64 WS Professional is priced to match. The Asus P5W64 WS Professional motherboard has a lot of integrated peripherals and thus is pretty big. At 30.5 x 24.5 cm in size the P5W64 WS Professional is full sized ATX. Asus has done a good job with the motherboard layout, and the ports are very well organized. We would have liked to have seen an IEEE 1394a jack on the rear I/O, but on the plus side it does have eSATA port there. We were pleased to discover the integrated 10/1000 networking cards are all based on a PCI Express connection to the system board, rather than the PCI bus. One active Gigabit network connection can bottleneck the entire PCI bus, so with the Asus P5W64 WS Professional, both Gigabit network cards are PCI Express based where this potential problem doesn't carry over. The Marvell four port Serial ATA II/RAID controller also connects to the system via the PCI Express bus. The only peripheral on the P5W64 WS Professional that runs on the PCI bus is the Texas Instruments IEEE 1394a controller. The board comes with just one USB and one IEEE 1394 Firewire PCI bracket, a COM port bracket, a full compliment of SATA data and power cables, and something called the Q-connector (more in bit). The manual is very detailed, and unusually provides a full list of qualified vendor parts for memory, PCI Express x16 videocards, PCI graphics cards, and RAID cards. Creating RAID arrays via Intel Matrix Storage technology and the Marvel chipset are fully documented, as are the BIOS options. While devices that run through the Serial port have virtually disappeared on the desktop side, they still have uses with workstation and server systems. A serial port allows users an easy way of accessing the system without much fuss, over RS232 protocols. The Rear I/O on the Asus P5W64 WS Professional is very busy so Asus makes a Serial port available via a header on the motherboard. With the potential for four PCI Express videocards, it is best to use a beefy (+400W) power supply here. Legacy ATX 1.4 spec power supplies (given away by a 20-pin main ATX power connector) are compatible with the Asus P5W64 WS Professional motherboard. Make sure there is 30A+ capacity on the 12V line and that the 4-pin molex connect just above the main power jack is also connected. On the whole, it's best to use an ATX 2.0 spec power supply (noted by the 24-pins of its main ATX connector) power supply with this motherboard, like the modular cable Seasonic M12 700W, or PC Power & Cooling's monster Turbo-Cool 510W Express/SLI. Either of those PSU's has the recommended ESP12V connector. 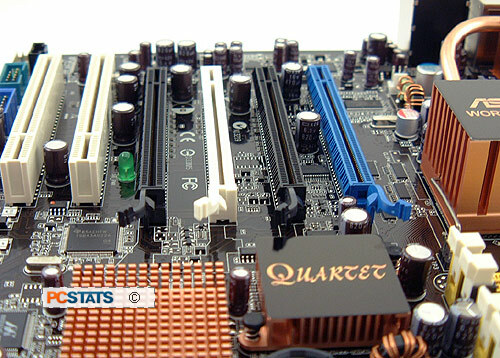 Most high end motherboards call for the EPS12V connector to deliver a stable and sufficient supply of power to the CPU. Realistically, legacy support for the single 4-pin auxiliary power connector is going to get dropped sooner rather than later. When running two or more PCI Express videocards, Asus recommends a 500W powersupply at least. What you can do with four PCI Express x16 slots? A Lot! There are three chipsets on the Asus P5W64 WS Professional motherboard which require cooling, all by passive heatsinks which will never fail, and don't create noise. There is the Intel 975X Northbridge, the Intel ICH7R Southbridge and a little something called the IDT 89HA0324 PCI Express bridge. The IDT chipset does get quite warm during use, but as long as the system has good internal airflow there should be no issues. By default the Asus P5W64 WS Professional runs its four PCI Express x16 slots in this configuration; starting from the first slot to the last it is broken down in x16, x0, x4 and x0 mode. In order to enable more than one videocard, say for CrossFire, you simply insert the secondary videocard into the adjacent physical PCI Express x16 slot. In the case of CrossFire, that would be slot 1 and 2, with each card getting 8 PCI Express lanes. When three or more PCI Express cards are installed the PCI Express lanes are divvied up in the following manner; x8, x8, x4, x8. If you add up the total PCI Express lanes this works out to, it does not equal 20 (16 via the 975X and 4 via the ICH7R), rather we have 28 PCI Express lanes. 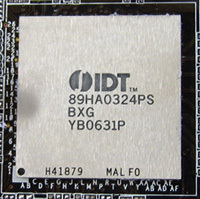 The IDT 89HA0324 chipset is where the magic happens. What the IDT chipset does is switch 8 PCI Express lanes between PCI Express x16 slot 2 and 4 evenly. In other words a total of 8 PCI Express lanes are allocated to both PCI Express x16 slots, but not split into two groups of 4 PCI Express lanes. It's slightly confusing and there isn't much detail available to explain it any better, but all you have to remember is that when working in 2D applications, there isn't much load on the videocards and this is how Asus makes the system work. Also remember the Asus P5W64 WS Professional motherboard supports ATi CrossFire, to enable that the CrossFire Master card is put into PCI Express x16 slot 1, the second CrossFire videocard into PCI Express x16 slot 2. The P5W64 WS Professional is designed for workstation use, like multi-monitor spreadsheets or displaying stock charts, and really CrossFire is not going to give you the best gaming experience from what's available on the market place. It's also important to remember the four physical PCI Express x16 slots are not limited to videocards only. You could also use high bandwidth PCI Express peripherals such as SCSI or additional Seral ATA controllers as well. Pg 11. Workstation Quality Motherboard?